Why don’t employees do what they are supposed to do? Former Columbia Graduate School professor and consultant Ferdinand Fournies knows. Over the course of two decades, Fournies interviewed nearly 25,000 managers asking them why, in their experience, direct reports did not accomplish their work as assigned. 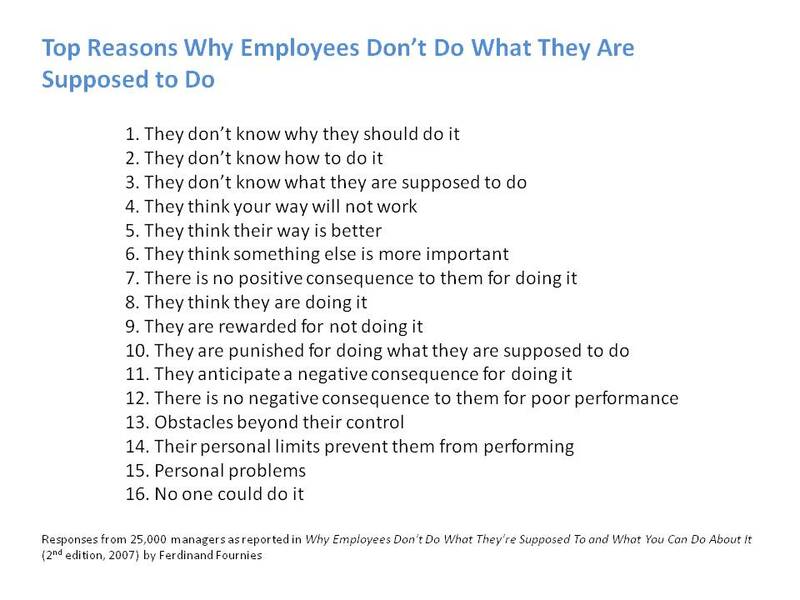 Here are the top reasons Fournies heard most often and which he described in his book, Why Employees Don’t Do What They’re Supposed To and What You Can Do About It. As you review the list, consider what you believe might be some of the root causes and solutions for each road block. Are your people doing what they are supposed to be doing? What’s the level of purpose, alignment, and performance in your organization? Do people have a clear sense of where the organization is going and where their work fits in? Are they committed and passionate about the work? Are they performing at a high level? Take a look at the conversations and relationships happening at the manager-direct report level. If performance is not where it should be, chances are that one of these roadblocks in getting in the way. PS: You can learn more about Ferdinand Fournies and his two books, Why Employees Don’t Do What They’re Supposed To and What You Can Do About It, and Coaching for Improved Work Performance here at Amazon. Both books are highly recommended for your business bookshelf. July 9, 2012 in Accountability, Alignment, Behavior Change, Business Books, Coaching, Communication, Employee Productivity, Engaging Employees, Feedback, Goal Setting, Human Resource Issues, Managing, Managing up, Performance Expectations, Performance Management, Research, Talent Management. Thanks for sharing this great information! I totally agree with everything you said in this post. I believe that it is very easy to get employees to do their work if managers and supervisors take the time to connect and listen to their people. Communication is key! I have to laugh. We were talking about this the other day. Our group is part of a Ken Blanchard affiliation, and the management DOES NOT look at this. They want enrollments, and dials! Talk time is key in our group. And the managers. The head of our group is 30 years, from another environment, and his beliefs??? ….. let’s say when his son cried about a buzz cut, he threw his own kid in the deep end of the pool! What a great guy! The American culture always try to find causes in human action. This is because even now believe that human beings behave as animals do! They don’t accept that human beings decide how to react to any cause. The decision is made always according the character, yet the set of beliefs. It is a matter of psychology not of procedures. That is why all the managing systems you teach fail. Human beings are not birds or dolphins my dear Ken Blanchard. Panos Regoukos from Greece. Is the post from Panos some kind of a joke? Given Greece’s complete failure on a scale so grand that it can’t be captured with words, how can they preach to any country. Much less to one that has dominated the world stage for many years. He is right, that apparently people in Greece think success looks much different than we do! I wonder, have you ever heard of Peter Scholtes and his book The Leader’s Handbook? I wondered, if you have, what your take of his management approach would be?